Why do our u/w photo course? ""I am amazed at the sophistication and detail in your course. It really has to be considered the standard of know-how in the industry."" 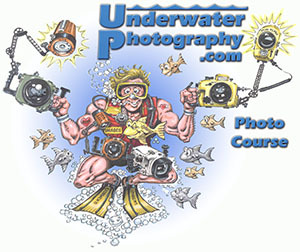 Thousands of underwater photographers have already taken the course and satisfaction is guaranteed. If you don't learn, you get your money back! ""In this course I am sharing everything I learnt in 20 years as a professional photographer and 25 years as a 2 star CMAS instructor. I'll give you the tricks that won my underwater images multiple awards in 10 countries."" We go way beyond the standard technical explanation to reveal the strategies behind the shot. ""The best investment I ever made to improve my photos""